This is not made by me, i just show it to you. My goal with this version of a train turntable was to make it out of existing LEGO bricks and make it work on a flat surface. Magnificent work and a great job in keeping it so low. 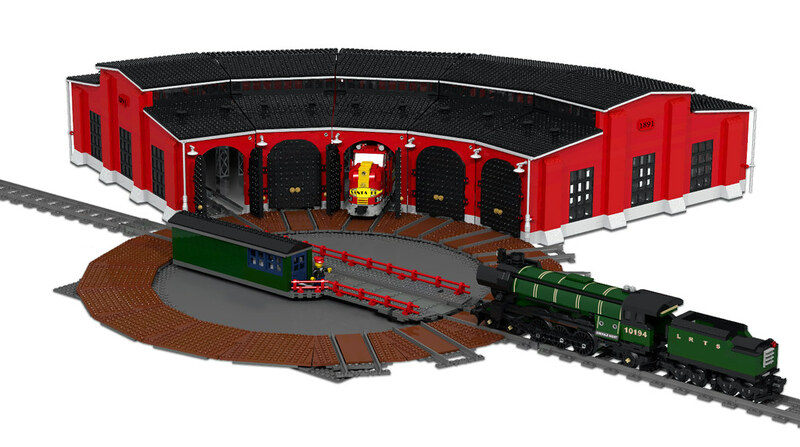 But that engine shed is simply perfect. I also like the scale of it. It is very good that it can actually fit a decent train like the EN. Most other turntables I have seen are way too small for that. Hard to say what is the more beautiful part of it. The train shed has just the right scale to make big locomotives also look big but still fit and also the pictures from inside on cuusoo look pretty nice. But also the turntable is just genius. Will be way easier to put it in a layout flat like it is. This train shed is amazing! Nicel, but i was wondering how a train handles the gap. Thanks for the many support words. The gap is only in the LDD version if you look at the youtube video I have used one half of the flex track remove the gap. It works great. What does the deck roll on at its outer edges? and also with 2 turn road plates that is also missing. That is a very good idea using those road plates and your video shows it working a treat. Now 93 supporters, I was the 25th! It is a great idea to make it work on a flat surface: thus everybody, even child, will be able to add it into their layout. Even more: make the round house modular il also really nice! I really like your project. The only point I find that is not so well done is the fact taht tracks and plates moves around the turntable when loco runs over it. But I'm sure it can be fixed easily with some 1x1 round plates! Great job! Congrats. I hope you'll get tones of supporters on cuuso! You've done a great job with the low profile turntable and the round house is magnificent. You've got my support as well! 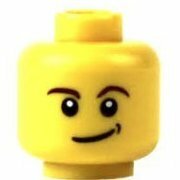 I supported as well, even if it doesn't hit the number you can still bricklink it easy enough if you really want to build it. The low profile is fantastic, great build. Supported on cuusoo. I hope it reach 10000 supporters. Wonderful! Supported! The low profile is perfect. If you didn't noticed it, thebrickblogger.com has just posted a nice preview on this turntable. The only problem I have noticed is that you used 18 tracks for the entire circle. This means an inclination of 20 degrees, while regular curves have an inclination of 22.5 degrees. So you can't use a curve to make two parallel tracks. I know that this is probably due to the pieces you used to make the base, but I think that a design more consistent with official sets could be a benefit. Thanks for the LDD files on Cuussoo. What I'm wondering: you use the double conical gears Z12 on the ends as wheels to turn the table. But the two conical gears that make both 'wheelsets' turn in different directions coming from the motor also touch the ground, and therefor will want to give the table partly an opposing direction. Or are you planning to put the two loose rubber bands in the LDD file around the double conical gears that act as wheels? That I exactly how it did it. The rubber tires fit between the two gears and makes it work. When you use the rubber bands the other gears dos not touch the baseplate. Thanks for clarifying. And is the little 90 degree turned wheel under the green house (3-4 studs back from where the operator is standing) there to prevent it tipping sideways? Don't you need one on the other side as well? No becasue the wight of the battery box is only on one side. Let me know your results with the LDD. And it would be great if others would make new rendering or images of the turntable.